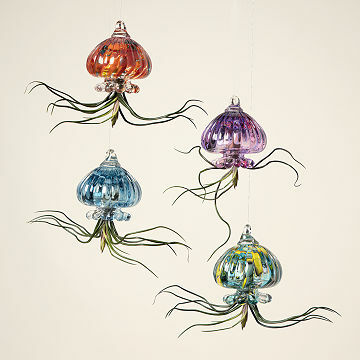 Glassblowers Berton and Christy Atherton Schrack make these cute sea creatures with air plant "tentacles." Hanging jellyfish planters with air plant "tentacles" are the sort of genius idea that, the moment you see it, you know should have existed long ago. But it took glass blowing duo Berton and Christy Atherton Schrack to not only dream them up, but make them this beautifully. Crafted without molds, the translucent "creatures" seem to float as if suspended mid-ocean, and are especially stunning in a window where sunlight can work its magic on the glass. In turquoise or warm-hued multicolor, they come with a live air plant, hand-picked by the artists to fit each one-of-a-kind planter. Hang one up and wait for waves of conversation whenever you have guests. Handmade in Portland, Oregon. Berton Atherton Schrack developed a love of nature while growing up near the Pacific Ocean in the foothills of Santa Barbara. He was inspired at an early age by its infinite variety of colors & patterns. When he was 7 years old, he was introduced to the art of glassblowing while on a family trip. Fascinated by the heat and fluidity of the art form, he was hooked. As a teenager he took local glassblowing classes and later apprenticed at a well known glass studio. Moving to Oregon in the 90's, he started his own glass blowing studio. At an art festival he met, fell in love with and married his spouse, Christy, an East Coast jeweler. Exploring each other's mediums, they combined their businesses and moved to Portland a few years later. Raising a family and working from their backyard studio, they are happy to be a part of the creative culture of the Pacific Northwest. When you get your new plant home soak in room temperature water for 20 to 30 minutes, gently shake and air dry (and possibly name) your plant before placing in your Jellyfish. If you live in an arid, hotter climate frequent watering or misting will be needed. Provide bright indirect light or full spectrum artificial light for your plant. Air plants do best in warm conditions (50 to 90 degrees). Jellyfish & air plants should be brought inside before temperatures drop below 40 F.
To maintain a healthy plant, soak your air plants once a week for 1 or 2 hours, gently shake off excess water & air dry before returning to your Jellyfish or Nautilus. It is important to make sure no water remains in the cups formed by the bases of the leaves as this may cause your plants to rot. Due to the delicate nature of living air plants, this item should be opened at the time of delivery and should not be shipped to below freezing climates. Plants need to be unwrapped right away. My brother and I bought this as a birthday gift for our mother. We are always on the lookout for unique, fun gifts for our parents. When I came across the jellyfish air planter I knew I found the perfect gift. It's just as described: beautiful and unique. Our mother absolutely loved it! Thank you! Stick the plant in the bulb and it's ready to go! We seriously love everything about this. The blown glass is beautiful and the plant fits perfectly. Really love how it's not massed produced, each jellyfish is custom to your new airplant and the instructions are very simple. Due to the delicate nature of the included living air plants, the Jellyfish Air Planters should be opened at the time of delivery and should not be shipped to below freezing climates. Plants should be unwrapped upon delivery.